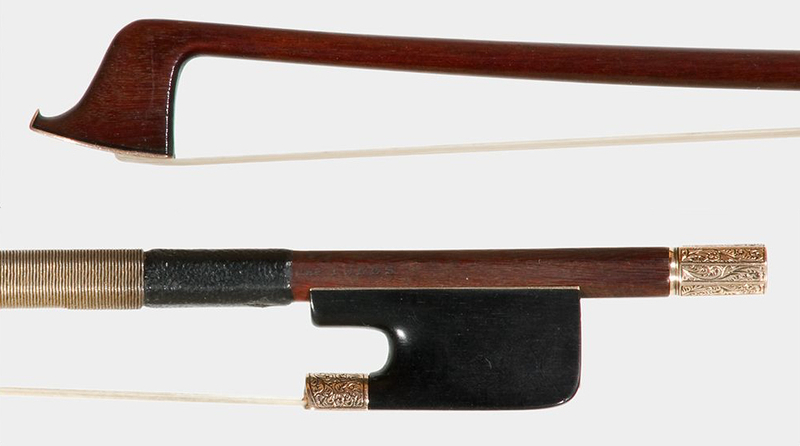 The Tubbs family took over from the Dodds as the leading English bow makers and dominated the craft from the 1830s until the early 20th century. Unquestionably the finest of them all was James Tubbs (1835–1921). Born into the third generation of Tubbs makers, James at first assisted his father, William, before working independently in London from the 1850s. He made many bows for the Hills, but the relationship soured after some of his bows bearing their brand won medals for the Hills in the 1862 London Exhibition. Later he took care to re-brand as many as possible of his Hill bows. Tubbs modelled his bows on those of the French school, following the influence of the Tourtes, Lupot and others. He developed a tradition of making fine gold- and silver-mounted examples to mark his birthdays, and also made bows as prizes for students at London’s Guildhall School and Royal Academy of Music. 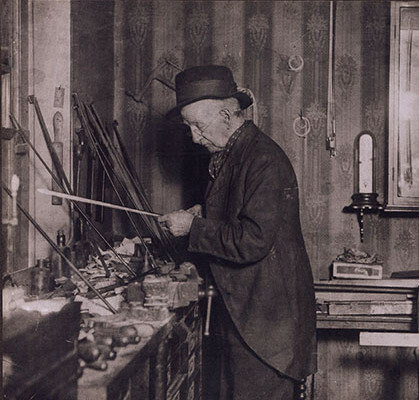 His growing reputation brought him the appointment of bow maker to the Duke of Edinburgh in 1874 and his workshop at 47 Wardour Street became famous. This example, which is in near mint condition, shows Tubbs’s characteristic head model, with a rounded top and a smooth front ridge. The chamfers are small but elegant and uniform. The button is long and typical with nearly no taper. The stamp is exceptionally crisp and even though the ‘Jas’ is slightly misplaced it shows an excellent rendering of Tubbs’s second brand. 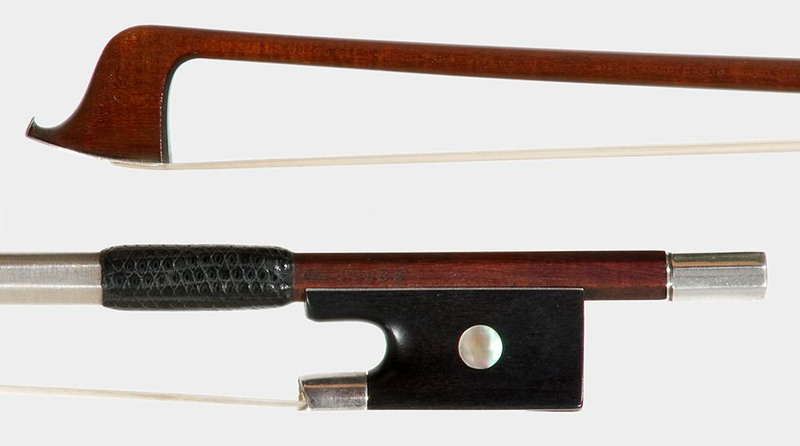 Although this bow is silver and ebony mounted, it is made from the same fine figured pernambuco that Tubbs used often throughout his production. Its metal head plate is fixed with five threaded pins: four surrounding the mortise and one at the tip of the nose. The nose of the head plate rises high above the tip and ebony liner. The button shows concentric lathe marks on the end face, while the thread of the screw is rolled, not cut, and the screw is threaded into the button. 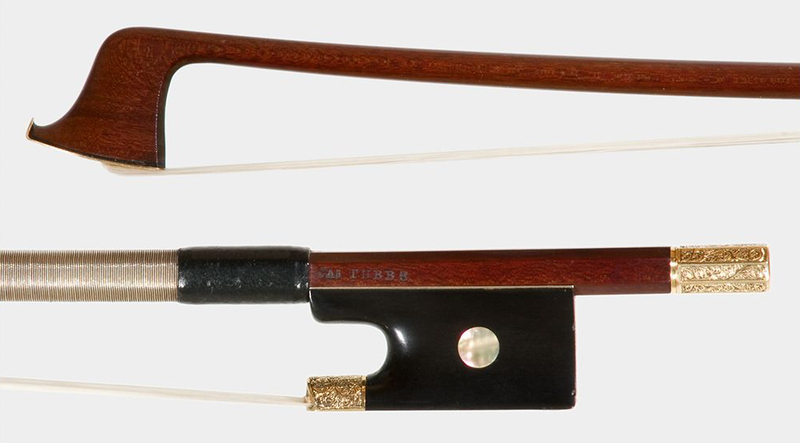 A fine example of a Tubbs prize bow, this one was presented to Winifred Williams at the Guildhall School. These bows were made between 1876 and 1910 and the engraving varies between periods, the script for this one being without serifs and very modern in appearance. The wood is reminiscent of early English pernambuco such as that used by the Dodds, and is clear and dense with a pronounced grain and occasional flame. This is a classic Tubbs birthday bow and is typical of his late period. It has a broader head, with small and less carefully carved chamfers, and the plain ebony frog has a rounded heel and squarer throat. The full sides of the frog have minimal hollowing, and the adjuster is in one piece. Traces of a heavier, more opaque varnish can be found, which is again typical of his later work. The gold mountings are chased throughout and the script of the birthday engraving on the slide is elegant and classic. The tip is fully chased, including the nose. The lapping, which is probably the original gold tinsel over thread, does not extend under the leather lapping. These bows were sold by Tarisio in 2010 as part of the Moennig Collection sale. View more bows by James Tubbs.